Do your eyes light up every time you see an algebraic formula? Does your heart skip a beat when someone asks you to find the area of a triangle? Do you look forward to your 8 AM math class, hoping that your teacher gives you a pop quiz on angles or percentages? The very thought of studying the pythagorean theorem probably makes you queasy, and the slightest mention of the SAT Math Section is likely to send shivers down your spine. Fortunately for you, we’re here to make the SAT Math Section a little more approachable. All throughout your academic career you’ve been taught that you should always answer EVERY question on EVERY test, even if it means taking a shot in the dark and guessing, all the while hoping that the math gods are smiling down upon you. “Just guess all Cs?” This strategy may work on your chapter review test, but definitely not on the SAT. Remember, you lose a quarter of a point for every wrong answer. Thus, in order to ensure that you can earn as many correct answers as possible, you may not even want to finish the entire math section. Instead, focus your energy on the questions you know you can answer correctly. So how do you know which questions to answer? Well the SAT math sections order their questions based on difficulty, starting with easy problems and ending with more difficult ones. Easy questions? Just do it! Move through these questions quickly without error, spending the least amount of time trying to solve them. You’re smart and will get most of them right anyway. Medium questions? Spend most of your time on this section. Don’t rush and feel free to write A LOT! Write out equations and draw pictures. You probably know the material, but these questions will require some extra attention. Eliminate the obvious answer. If it seems too easy, it’s probably incorrect. Eliminate repeat numbers. If a question shows a number in the problem and the same number is an answer choice, it’s probably a trick–don’t let them lure you in! Eliminate the answer “it cannot be determined from information given.” This is usually a lure for students who are not able to solve the problem and likely to be incorrect in the difficult section. Here’s another classic score boosting strategy! The majority of the math exam is multiple choice. What does this mean for you? The correct answer is already staring you in the face; it’s up to you to narrow down the answers! Instead of trying to write a bunch of equations and solve a big mess of variables, pick a value and plug it in to see which one of the five answer choices fits the bill. 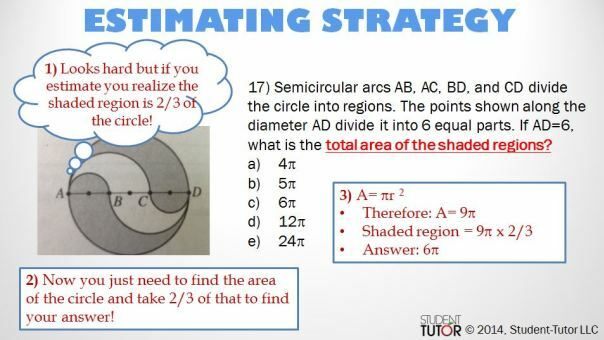 If the answer choices to percent problems are all percentages, the answer choices to word problems are all algebraic expressions or variables, or the problem says “in terms of,” you will want to use this strategy. Similar to plugging it in, the “Answers First” strategy works best for complex word problems with numeric answer choices. Basically, close your eyes (not literally) and choose an answer choice to check against the problem. You have a 20% chance of guessing right on the first try. If you do manage to guess correctly on your first try, CONGRATS! Go buy a lottery ticket after the SAT! If not, don’t fret. You’re now one step closer to getting the correct answer. So let’s say you’re not feeling very lucky the morning of your SAT test. Which answer choice should you try first? 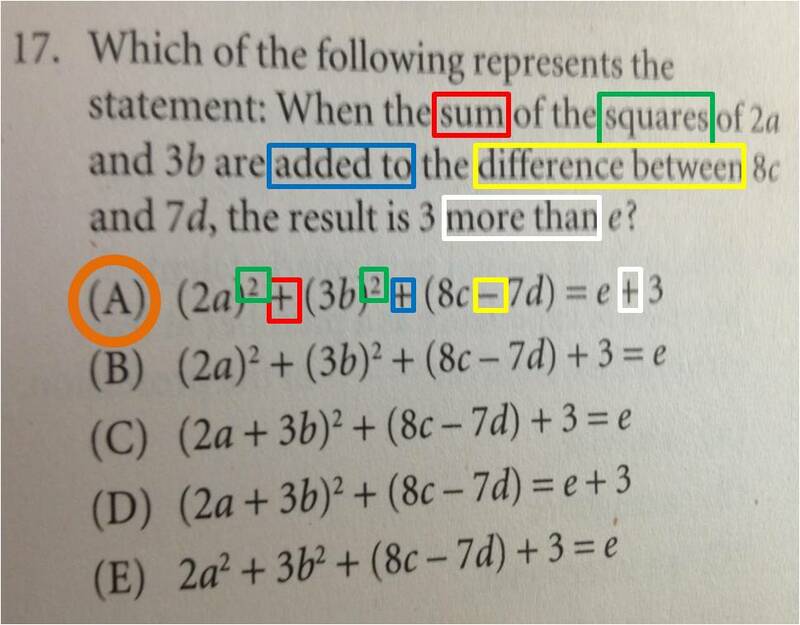 Answer = C Answer choices are always ordered from least to greatest, so choosing C is a savvy starting point. If you find that C is incorrect because the value is too high, then you can automatically discount choices D and E since they will be too high as well. If the value of C is too low, then the same goes for choices A and B. Wow, we just narrowed down your choices from 5 to 2 in one step. You’re welcome! No, we aren’t talking about America’s favorite pastime. What we’re really getting at is our favorite strategy: ESTIMATING! This especially comes in handy with problems that have a diagram or require that you draw a diagram. Quick fact! Unless the test specifically indicates that a diagram is “not drawn to scale”, it is ALWAYS drawn to scale. In questions that have no diagrams, are not drawn to scale, or contain only partial information, use the given information to sketch your own complete diagram. Then, estimate what the answer is. Simple enough, yeah? Check out this sample question! Remember the good old days when math didn’t include the alphabet? Well, those nostalgic times are far behind you now and it’s only going to get more complicated when you throw in all types of symbols, letters, and phrases. But don’t let all the weird symbols freak you out. Look past them and change word problems into algebraic equations that you can solve. Numbers are easier to add than letters anyway. Being able to translate “math language” is an important skill to develop before taking the SAT. Most of the problems will not include any addition, subtraction, multiplication, or division symbols. Instead, they will feature phrases to test your knowledge and understanding of this foreign language. Now that you know what to expect, the math section shouldn’t feel as daunting to defeat. 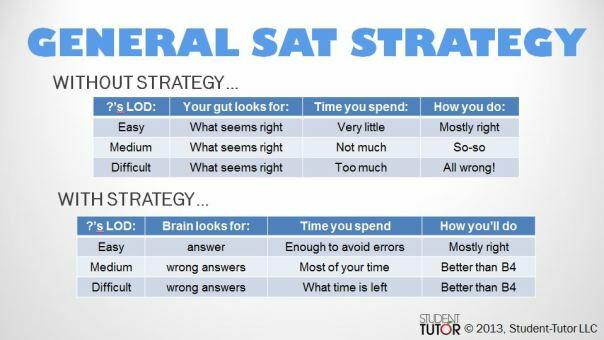 By implementing these five strategies (and of course, the process of elimination), you are on your way to SAT success! But before you go off and ace your SATs, let’s do a quick recap of everything we talked about today. Learn the beautiful language of math! 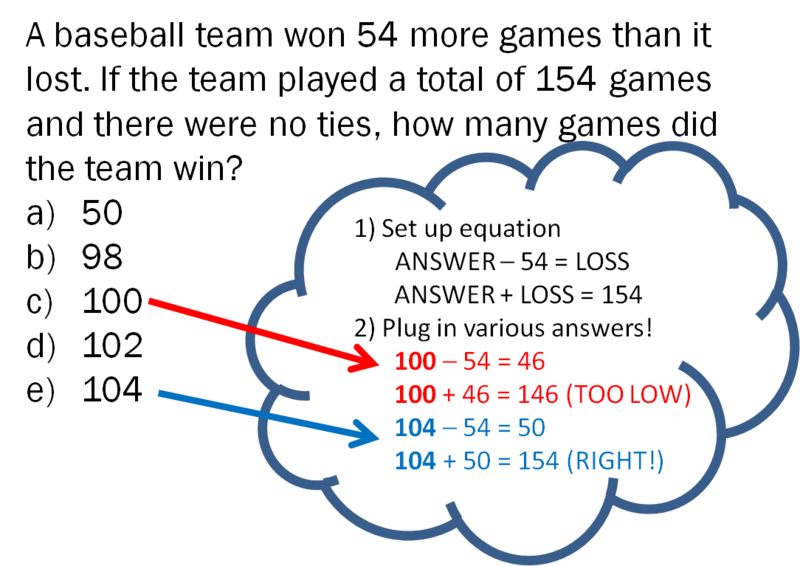 You will increase your math SAT score immediately once you apply these tips! Got any other good SAT Math strategies? Let us know in the comments below! Thank you very much, Mohammad! So glad you found it positive. Do you have any other techniques you have tried that work great? Hi Todd! I was just wondering if you had a guide or some tips for graphs and functions on the SAT? These are the two areas on the math section where I struggle the most. Thanks for your help! I took an SAT prep class at a local state university, and we were told not to use the number 2 for “plug it in” because there’s too many special exceptions with it (2+2=2*2=2^2). Other than that, I found this site very helpful – I’ll be revisiting a lot before I take the test this December! Thanks for your feedback on the number 2 strategy, we’ll definitely look into that. I’m glad you found the rest useful to you. Our blog has plenty of SAT guides so be sure to check them out, and good luck on your future exam! Well i wanted to know if there are any other ways to study for the SAT. I want to know if everything we learned is going to be on the SAT. And is there a formula we can act on to get a higher score on the SAT. This is a lot of things that I did when I took the SATs last year. The easiest part for me was narrowing down my answer selection, which was elimination. I did notice too that they had the easier questions at the beginning but I went through them the fastest and used most of my time on the harder questions. I will remember to use most of my time on the medium level questions the next time I take the test.